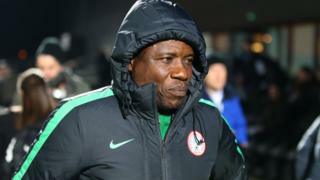 Shock, vex and 'na lie', na so Nigerians dey take react to video wey show as Super Eagles chief coach Salisu Yusuf dey collect money from undercover tori pipo. Na Ghana tori pesin Anas Anas do di video wey BBC Africa Eye don broadcast. For di video, Salisu collect $1000 from Anas pipo wey pretend say dem be players agents, to make am cari two players go di African Nations Championship, wey happun last year. Salisu don deny say im do anytin wrong and say na $750 im collect from di pipo.